Automation in scroll control is a breeze. Furthermore, it is fully compatible with Scroll Control. This will allow you to upgrade your workflow and create professional sounding mixes in no time. First of all, you will need to load the plug-in which you would like to automate. 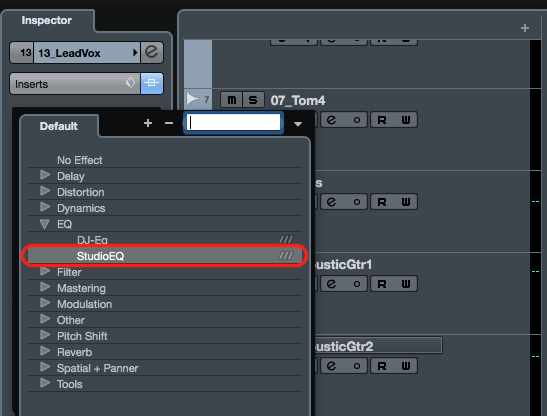 This is very easily done by heading to the insert area and selecting the desired plugin from the list. Cubase has two automation modes, read and write. In this case, as we will be writing in automation to Cubase we will need to select write. This is done by simply pressing the "W" on the channel. Now that Cubase has been instructed to write automation, all you have to do is play the track and control the plug in in the desired manner. Hover your mouse over the desired parameter and control the software knob using Scroll Control. If you are controlling the level, you do not have to load a plug-in you can simply use Scroll Control on the level fader in the mix console. The final step is fine editing the automation to make it exactly as you want. This is done by right clicking on the track you are automating and selecting "Show Used Automation". You can now see the automation traces and edit them in the usual manner.